To offer voluntary services of its members during natural calamities or social and religious festivities like Navaratri, Ganesh Utsav, Republic Day program. The Mandal on request deputes volunteers in the management of International Cricket Competition held at different places. To run rehabilitation centers for physically handicapped & mentally retarded people. 2. 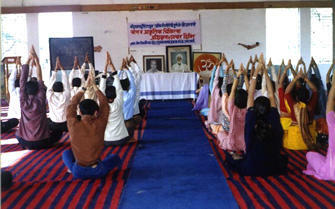 Organizing various classes like physical fitness, aerobics and swimming. 3. Organizing guest lectures on health care, personality development and such other subjects. 4. 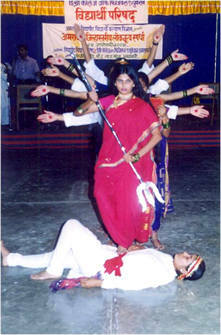 Organizing cultural programs, self defense camps and celebration of traditional programs for developing a sense of integration. To organize diagnostic & treatment camps for needy & poor people. 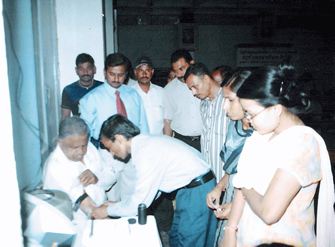 Mandal organizes camps for Blood testing, Hepatitis B treatment, Children's check up, Aids Awareness and Pulse Polio. 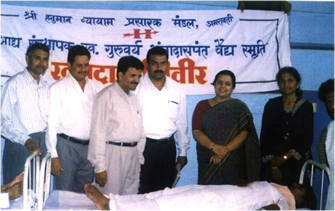 Blood Donation camps are organized on various occassions which is used to donate the blood to needy persons. Nearly 500 students and teachers of the institution donate their blood every year. The Mandal maintains a list of blood donor students & staff who donate blood from time to time as per the requirements. To help for rehabilitation & revival of Akharas & Vyayam Shalas in rural areas of Vidarbha. Also help to organize and conduct the sports-meets of Govt. & Non Govt. organizations, social and educational institutions and clubs etc. To impart free of charge education to deserving orphan boys & girls. The Mandal organizes Pre-Recruitment Training Camp for Adivasi Youths of Maharashtra. The Mandal has started 'Child-Line' programme under the guidance for children, with the co-operation central Govt. for the rehabilitation of the missing children. 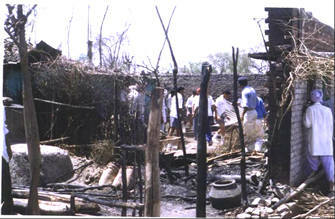 It provides all necessary help, like shelter, meals and clothes etc. to the distressed children. To run 'Samaj Jagruti Abhiyan' on different subjects like National Integration, Sarva Dharma Samabhav, Tree Plantation, Aids, Pulse Polio and De-Addiction ... etc. To organize District Level Sports Festival and Leadership Camps for Tribal youths and Orientation Courses for the Teachers of Ashram Shalas. Vidarbha Shetkari Jagruti Abhiyan has been started by Mandal along with the joint collaboration of Bank of Maharashtra and Shri Shivaji Shikshan Sanstha keeping in mind “Jai Jawan Jai Kisan”. 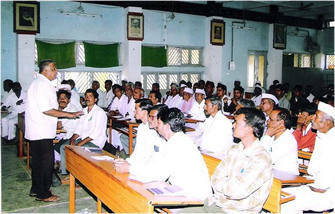 The main aim of this program is educating farmers for farming techniques, exhibition of new equipments, forming constructive committees at local village level and provide them financial support. The farmers from various villages are been given special coaching on various facets of farming by expert staff of Shivaji Agricultural College. This program is runned every Saturday and Sunday. All lodging, boarding, traveling facilities and expenses is managed by Mandal. Till now 2000 farmers have taken the advantage of this activity. Village wise Constructive committee helps to solve problems of local farmers, to get different latest government projects and to solve problems related to Govt. offices. From this program 30,000 farmers from 6 districts will get training. A strong body or committee will evolve through this mission in order to solve the problems of farmers on their own level. So the Mandal has provided its motto “Aage Badho Sabse Aage Badho” to all farmers. Special help for this activity is provided by Siddhi Vinayak Group (Amravati), Shri Gajanan Maharaj Sansthan (Shegaon), Dr. Punjabrao Deshmukh Krishi Vidyapeeth (Akola), etc. Prime Minister, Shri Manmohan Singh has recently sent an appreciation letter to Nirmalatai Deshpande, President of Shree H. V. P. Mandal, praising the activity and efforts taken by the Mandal for Vidarbhian farmers.